A slow night but a fast day. 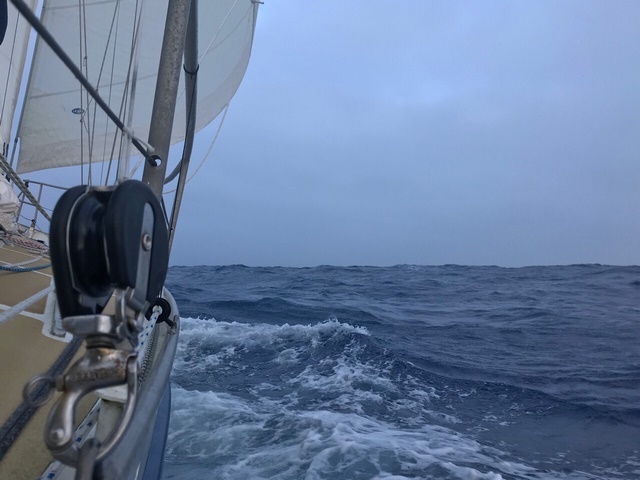 Wind has filled in from the NW, and I’m meeting it with both headsails. Even with reefs, they are big and billowy and we scoot along at seven knots. Clear skies give way to fog which clears and then reforms. But sun or no sun, it’s cooling down quickly, more quickly than the above daily temperatures indicate. I’m back to insulated rubber boots and an extra layer of fleece. The cabin was 50 degrees when I woke. If this descent to the Horn is like the last, it will be below 45 in the mornings soon. 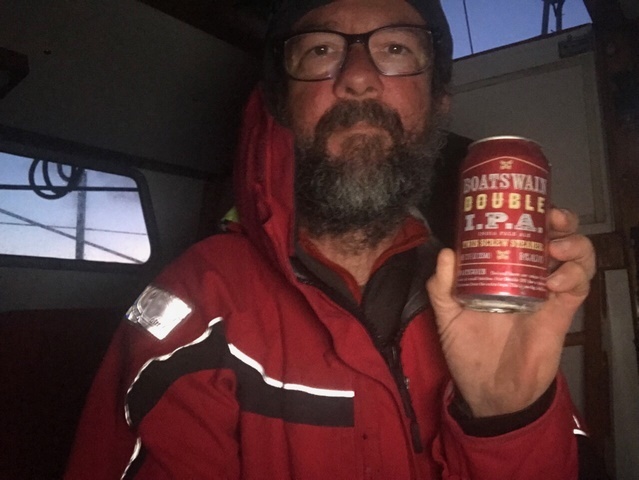 We departed San Francisco with 186 cans of brew aboard, and they took up so much space and contributed so much to overall weight, I just couldn’t fathom putting on one more can, though I knew they wouldn’t last the voyage. It was the right decision, but I rather regret it now. This event has led, today, to reflections upon my overall consumption of provisions in the first 159 days of the Figure 8 2.0 and how much lighter Mo must be now than on departure day. The back-of-the-envelope math looks something like this. A monumental event yesterday. My one-beer-per-night ritual was dramatically altered when I consumed the last beer. Well, not quite. I still have a flat of light, lemony stuff I dislike, which is being saved for our climb into the tropics. But the last good beer has gone the way of all … malts. -Canned goods: 3 cans per day at approximately 1lb per = 477lbs of canned goods consumed. -Dry Grains: 22lbs of Muesli, 9lbs of pasta; 6lbs of Quinoa; 4lbs of Polenta = 41lbs. -Crackers, cakes, flour for bread baking, etc. = 15 lbs. -Clif Bars: 238 consumed (1.5 per day) at 2.4oz per = 35lbs. -Coffee: 15 12oz bags = 11lbs. -Dry Milk: 5 3lb cans = 15lbs. TOTAL WEIGHT OF FOOD CONSUMED = 594lbs. -100 gallons of water. (We’ve consumed approximately 159 gallons but caught about 50, so the net is around 100.) At 8.34lbs per gallon, water weight consumed = 834lbs. -159 cans of beer. At 16oz per can, that’s 20 gallons of beer. Using above weight-of-water figure yields 166lbs. -10 bottles of wine. A 750ml bottle is a fifth of a gallon; so two gallons of wine consumed = 17lbs. TOTAL WEIGHT OF LIQUIDS CONSUMED = 1,017lbs. -1.5 20lb tanks of propane = 30lbs. -90 gallons of diesel. At 7.5lbs per gallon = 675lbs. TOTAL WEIGHT OF FUEL BURNED = 705lbs. How much lighter is Mo today than when she departed San Francisco five and a half months ago? Well, 2,316lbs, to be exact.